Britain's Chris Froome saw his podium hopes diminish further as Joaquin Rodriguez tightened his grip after a brutal stage 16 of the Vuelta a Espana. Froome ended five minutes 11 seconds behind stage winner Dario Cataldo after a severe climb to the summit finish. 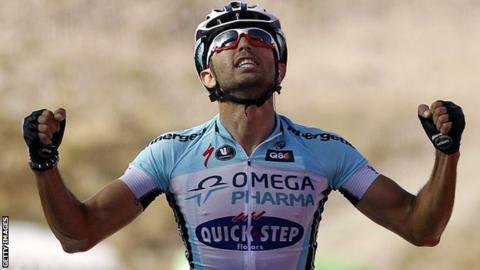 Spain's Rodriguez finished third behind Thomas De Gendt to stretch his lead over Alberto Contador to 28 seconds. Contador was 10 seconds adrift in fourth with Alejandro Valverde fifth to cement third place with Froome fourth. Italy's Cataldo dropped breakaway companion De Gendt of Belgium with two kilometres to go of the mountainous 183.5km ride from Gijon, and held on at virtually walking pace for victory on the summit of Cuitu Negru. Rodriguez fended off several attacks by countryman Contador to maintain his overall lead. "This is a big step forward, I felt good throughout the climb and I can be satisfied," he said. "I always said my big objective was to reach the end of these mountainous stages in northern Spain as leader and then take it from there. "There's still a long way to go, six days of racing, but the seconds I took today on my rivals are a little bit more of an advantage for me. The most difficult part of the Vuelta is behind us now." Team Sky's Froome, who was second behind team-mate Bradley Wiggins in the Tour de France, dug deep at the end to limit the loss to Daniel Moreno, who is fifth overall. The Spaniard crossed the line 29 seconds in front but Froome still holds a two minute six second advantage. Tuesday is a rest day before the peloton tackles another hilly stage from Santander to Fuente De in northern Spain. Saturday's penultimate stage features a final mountainous ride from La Faisanera to Bola del Mundo before the finish into Madrid on Sunday. 1. Dario Cataldo (Ita/Omega Pharma - Quick-Step) 5:18:28"
2. Thomas De Gendt (Bel/Vacansoleil) +7"
3. Joaquin Rodriguez (Spa/Katusha) +2:39"
4. Alberto Contador (Spa/Saxo Bank) +2:41"
5. Alejandro Valverde (Spa/Movistar) +2:58"
12. Daniel Moreno (Spa/Katusha) +4:42"
14. Chris Froome (GB/Team Sky) +5:11"
1. Joaquim Rodriguez (Spa/Katusha) 63:38:24"
2. Alberto Contador (Spa/Saxo Bank) +28"
3. Alejandro Valverde (Spa/Movistar) +2:04"
4. Chris Froome (GB/Team Sky) +4:52"
5. Daniel Moreno (Spa/Katusha) +6:58"
6. Robert Gesink (Ned/Rabobank) +7:28"
7. Andrew Talansky (US/Garmin) +8:28"
8. Laurens ten Dam (Ned/Rabobank) +9:00"
9. Igor Anton (Spa/Euskaltel) +9:11"
10. Nicolas Roche (Ire/AG2R) +11:44"